Advertisement from supplement of the ‘Evening Star’, 10 April 1893. 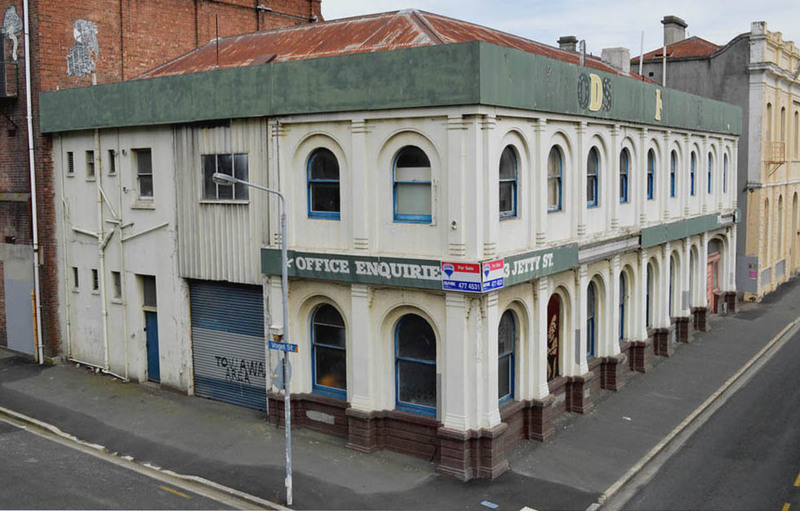 Ref: Eph-E-BUILDINGS-Dunedin-1893-01. Alexander Turnbull Library http://natlib.govt.nz/records/23156921. The City Boot Palace! The name conjures up images of a vast array of footwear in a setting of Victorian opulence, perhaps presided over by some magnificently moustachioed manager. 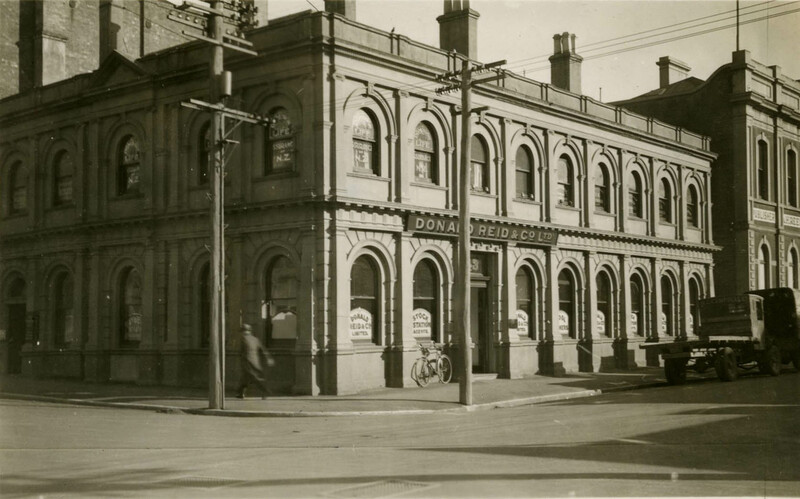 It may not have been quite like that, but Dunedin’s Boot Palace did have an air of grandeur which set it apart from most George Street buildings of the 1880s. The building was erected for Benjamin Throp (1845-1933), a dentist who occupied the upstairs rooms and leased out the lower level. Born in Halifax, Yorkshire, Throp arrived in Dunedin with his mother in 1861 and qualified as a dentist in 1868. In the early days he used only hand instruments, and his equipment and supplies had to be imported from England and the United States, often taking over a year to arrive. Up to 1900 the only anaesthetic he used was cocaine, and he later produced his own nitrous oxide (laughing gas). He also made his own gold plate, having worked as a goldsmith during his youth in Australia. Throp’s meticulous notes held in the Hocken Collections record that he made 37,162 extractions over 37 years. One day, when fitting the gold mining entrepreneur Alex McGeorge with some false teeth, Throp was offered a partnership in the Electric Gold Dredging Company. This proved to be a lucrative venture that ultimately netted him between £20,000 and £30,000. He retired in 1905 to take up farming at Moa Flat Estate, but his son Frank Throp continued the dental practice at the same address until 1942. Two other sons were killed in action during the First World War. Another dentist, Andrew Aitken, kept the rooms up to 1958, and during this period the building remained in the ownership of the Throp family. Architect James Hislop designed the building, which was erected on the site of the old Dornwell & Rennie butchery. Tenders were called in June 1885. The contractor was Arthur White and the cost approximately £2,800, but White went bankrupt during the course of the contract because his tender had been too low and he found he couldn’t afford to pay all of the creditors connected with the work. 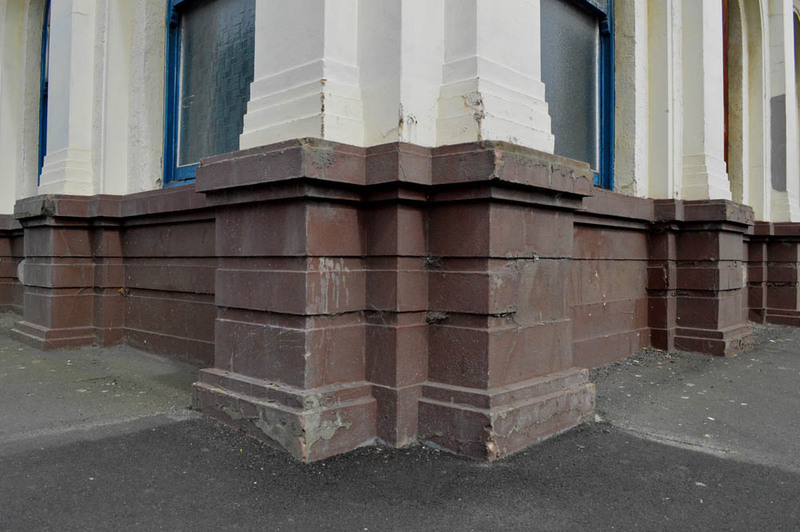 The building has a foundation of Port Chalmers stone that rises above the footpath, and the two storeys over this are constructed of brick rendered with cement plaster. An abundance of ornamentation includes pairs of Corinthian pilasters, arched and triangular hoods, rustication, and more mouldings than you can shake a stick at. Originally, there was a bold and elaborate parapet with balustrades and pediments that balanced the composition. A pillared verandah for the George Street shop front featured decorative cast ironwork. The overall effect was more ostentatious than elegant, but the building made a confident statement on the busy corner site. It is a good example of the later phase of Victorian Renaissance Revival architecture, which in its more florid forms drew from increasingly eclectic influences combined in unconventional ways. Hislop provided a further example of this movement a few years later when he designed the New Zealand and South Seas Exhibition buildings of 1889 in a flamboyant quasi-Moorish style. Among the new buildings which are being erected in the City, that designed by Mr James Hislop for Mr Throp, and situated at the corner of George und St Andrew streets, is deserving of description. It has two storeys, and is of Italian design. Constructed of Port Chalmers stone and brick, with cement, it presents a very fine appearance. The exterior of the building is, however, more than equalled by its internal disposition and finish, and its novel and chaste fittings do credit to all concerned. In the lower portion of the building a boot business is to be carried on, the apartments in the upper storey being utilised by Mr Throp in his profession as a dentist. The building has a frontage of 75ft to St Andrew street, and of 23ft 6in to George street, and its height from footpath to parapet is 38ft. The shop fronting George street is 40ft x 23ft 6in by 14ft 6in high, and a show-room behind this is 36ft x 22ft. The latter has a tiled floor and hand-painted windows, and, with the shop, is fitted up in a most picturesque style. 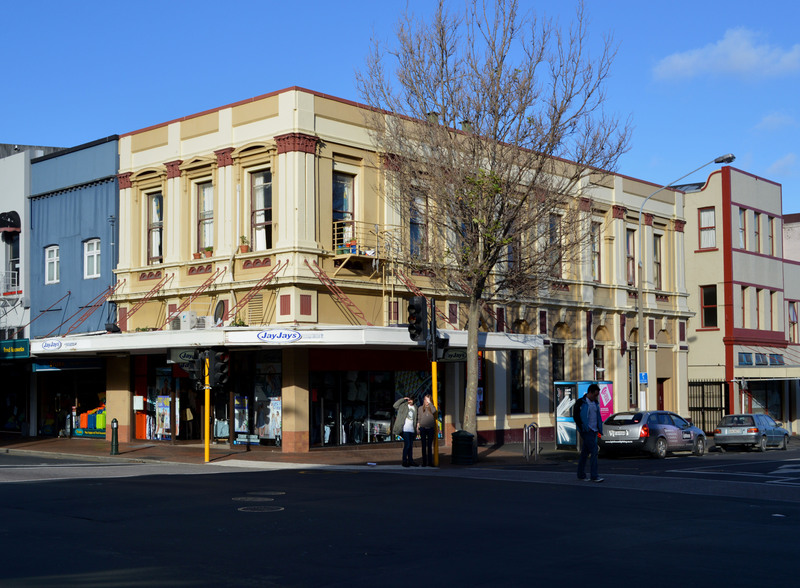 Over the footpath in front of the shop there is a cast-iron verandah, roofed almost entirely with glass, and on the corner of the two streets stands a novel pediment containing the name of the premises, ‘The City Boot Palace.’ Three plate-class windows, 7ft6in x 12ft, which give light to the shop, are probably the largest containing one piece of glass in the City. The exterior of the shop is in picked red pine and American walnut. The first floor is approached from St Andrew street, and the entrance vestibule belonging to it is neatly tiled. At the top of the stairs there is a lantern light of especially neat design, and the different apartments are lighted with hand-painted windows. The nine rooms which are contained in the floor are all cemented and decorated with stencillings and paintings, which reflect infinite credit on Mr Scott, who had charge of this department of work. The rooms are all 12ft 6in high, and, with their tiled hearths, over-mantles, dadoes, etc., are most luxurious looking. Special attention has been paid to the ventilating of the building, and the system which Mr Hislop has worked upon cannot fail to be attended with beneficial results. An ingenious piece of mechanism in connection with the building is an electric bell, which rings as anyone ascends the stairs leading to Mr Throp’s apartment. It is worked by two steps as they are trod upon, and the mechanism is so arranged as to be temporarily thrown out of gear by anyone descending the stairs. If Mr Throp is to be visited by burglars, this little device may come in useful in more ways than one. This building has been in course of erection since July, and will be finished in a week or two. Advertisement from the Otago Witness, 20 February 1907 p.84. Image from Papers Past, National Library of New Zealand. Otago Witness, 10 June 1908 p.92. Image from Papers Past, National Library of New Zealand. Throp took occupation of his rooms around the beginning of March 1886 , and the Boot Palace opened soon after. The City Boot Palace had been established in 1883, when it succeeded the business of the boot maker John Elliott. 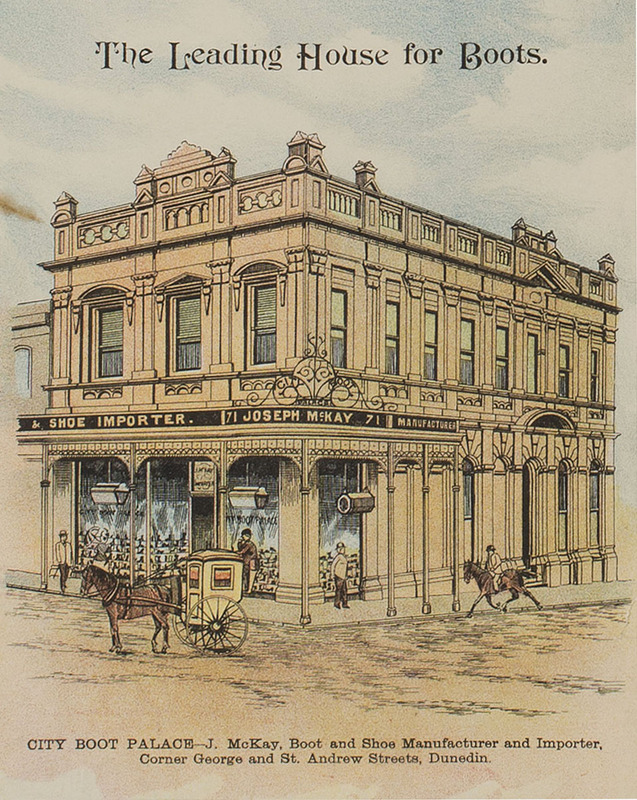 The same name was used elsewhere in Australasia: John Hunter’s City Boot Palace in Sydney opened in 1877, and both branches and separate businesses with the name operated in centres that included Adelaide (opened 1882), Brisbane (1888), Perth (1893), and Hobart (1906). In New Zealand there were boot palaces in cities and towns that included Timaru (opened 1885), Invercargill (1885), Oamaru (1886), Napier (1893), New Plymouth (1903), and Christchurch (1906). 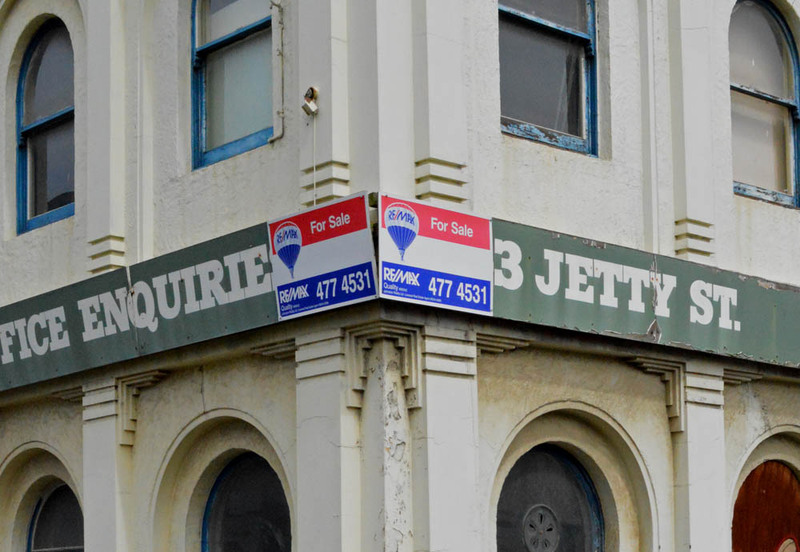 The name became almost generic and although there may have been some sort of licence or franchise agreement, the New Zealand boot palaces appear to have been independent businesses. The Dunedin manager from 1885 to 1908 was Joseph McLoy McKay, who in the Edwardian period ran humorous advertisements such as the one above, which emphasises the bargain prices and good value of the merchandise. 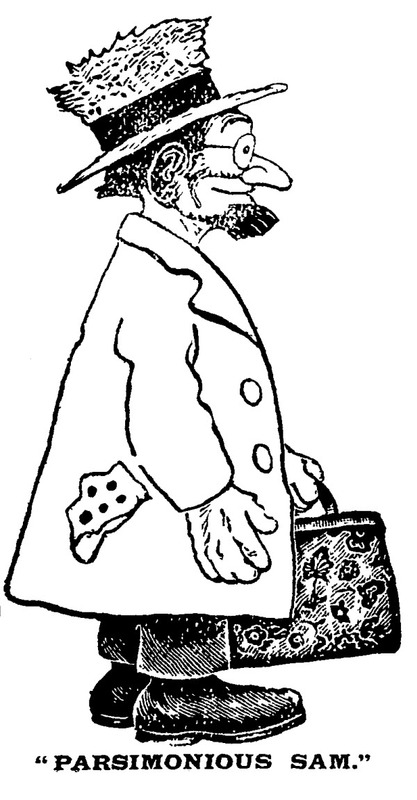 Some featured the character ‘Parsimonious Sam’, whose penny pinching ways were satisfied by the deals to be had at the City Boot Palace, suggesting that they should be good enough for anyone. 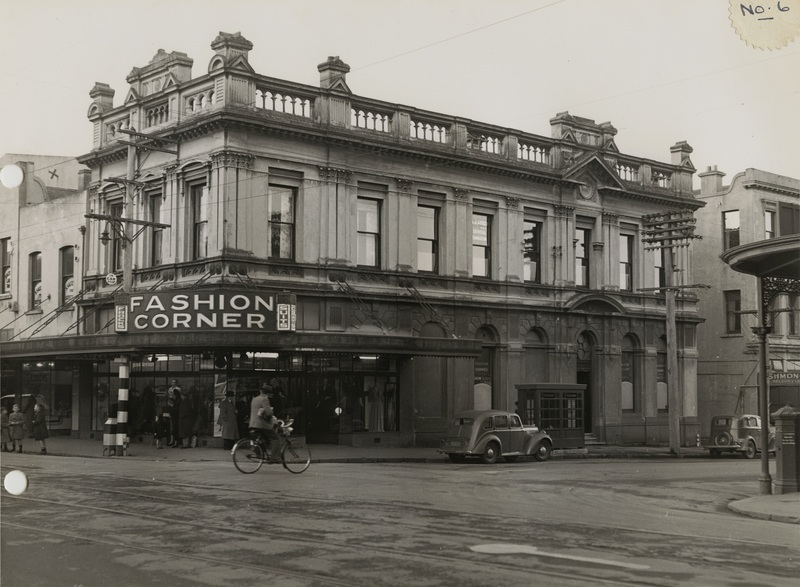 The building in 1949, during its days as ‘Fashion Corner’. Perpetual Trustees records, Hocken Collections, S13-583b. 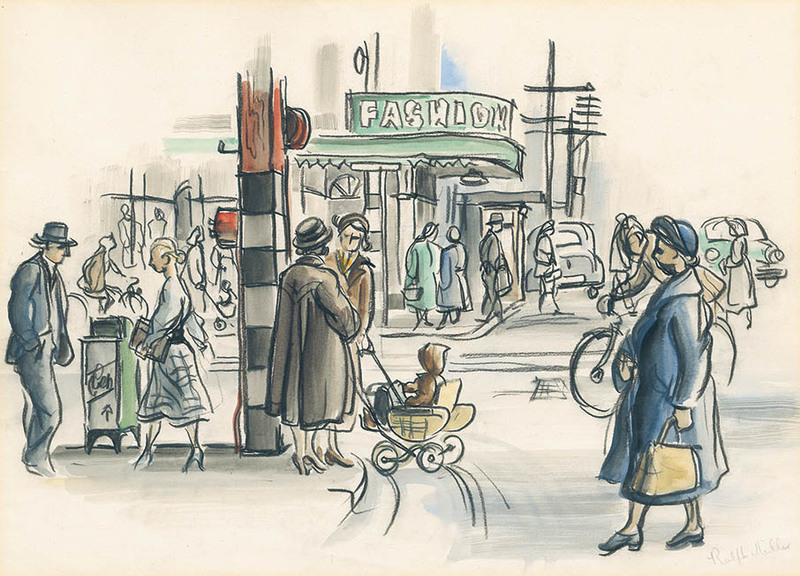 An evocative depiction of the intersection: ‘Street corner’ by Ralph Miller, conté and wash c.1945-1955. Reproduced by kind permission of Brian Miller. 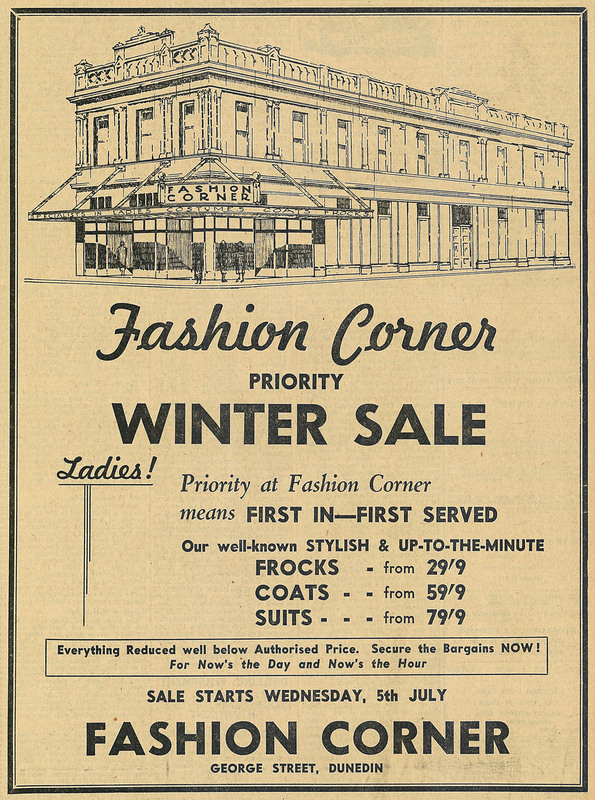 A wartime advertisement for Fashion Corner from Otago Daily Times, 4 July 1944 p.3. The boot palace ran for over 40 years and eventually vacated the building in 1929. It was then fitted with new shop fronts with mahogany facings and granite, and a new steel hanging verandah. The alterations were designed by the architects Mandeno & Fraser, and the contractors were the Love Construction Company. The women’s clothing store Fashion Corner opened for business in December 1929. 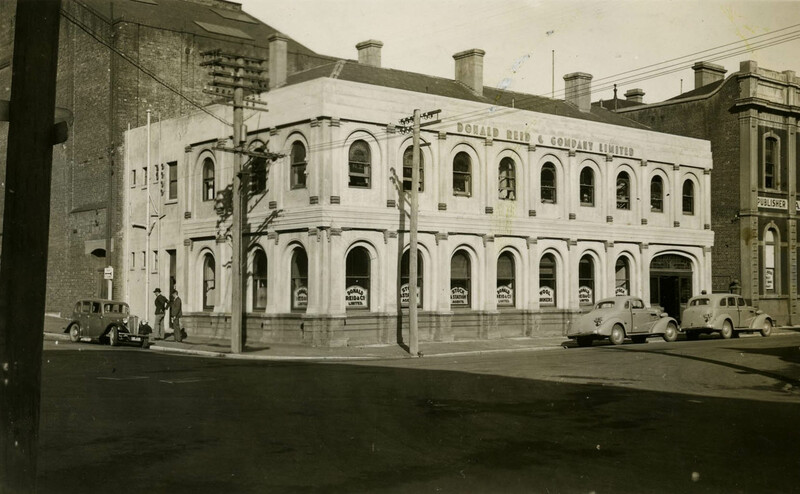 It operated until 1958, when the ANZ Bank took the building as a branch office. It was around this time that the parapet ornamentation was destroyed and the St Andrew Street entrance moved. Old interior features have also disappeared through numerous renovations. In 1983 the architects Salmond & Burt drew up plans for a new bank building on the site, but the scheme was abandoned. After nearly 40 years the ANZ consolidated on a new site in 1997. The ground floor is now occupied by the clothing retailers Jay Jays, making it once again a ‘fashion corner’. Most of the external character remains intact, and with some restoration perhaps the building will one day reiterate the vivacious statement it once made on this busy retail corner. Otago Witness, 21 July 1883 p.29 (J. Elliott at 75 George St), 6 March 1886 p.16 (Throp’s new premises); Otago Daily Times, 30 May 1885 p.3 (Boot Palace business sold by Hislop), 1 April 1886 p.2 (Boot Palace in ‘new premises’), 21 April 1886 p.4 (Arthur White insolvency), 26 November 1889 p.6 (Hislop named as architect); Evening Star 5 June 1885 p.1 (call for tenders for removal of old buildings), 11 June 1885 p.1 (call for tenders for construction);30 January 1886 p.2 (description), 10 December 1929 p.5 (description of alterations). 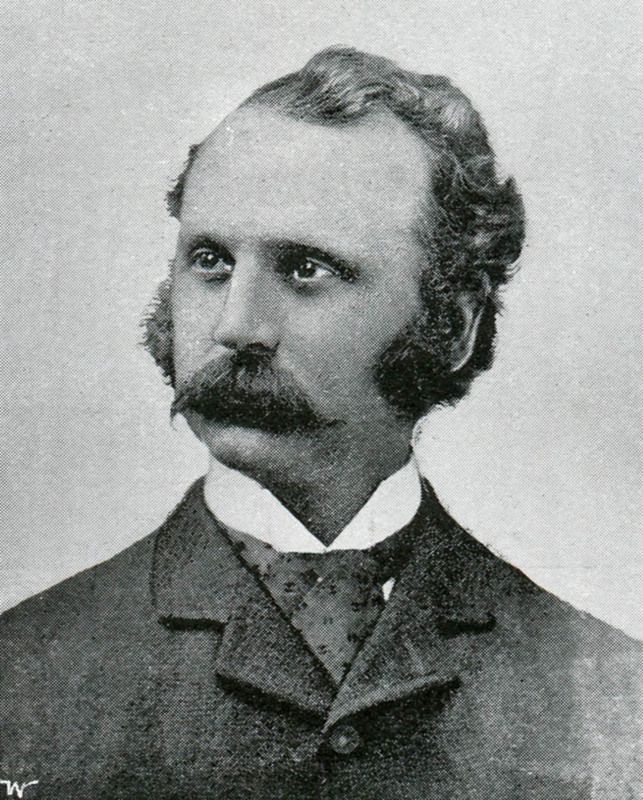 Sinclair, R.S.M. Kawarau Gold (Dunedin: Whitcombe & Tombs printers, 1962), pp.44-45. Throp, Benjamin: Dental practice records book. Hocken Collections Misc-MS-0871. Entwisle, Peter. 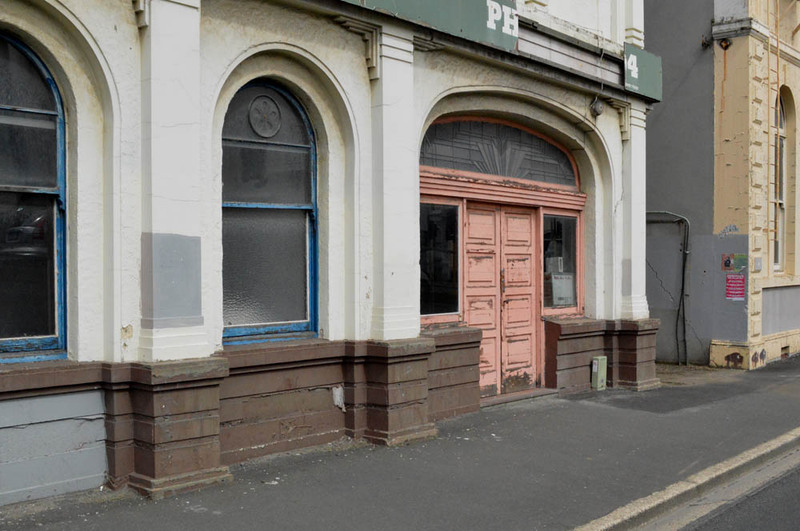 Draft report DDPL110-35, Dunedin City Council Heritage Schedule Review (and further discussion with the writer). This entry was posted in Uncategorized and tagged 1880s, Arthur White, Boots and shoes, Dentists, George Street, James Hislop, Mandeno & Fraser, Renaissance revival, Retail, St Andrew Street, Victorian on 21 November 2013 by David Murray.